From the contents of my inbox, it is clear that nonprofits are getting the message—online giving is growing. Every day, sometimes several times a day, I get an email from an organization exhorting me to give now. This is all to the good. But the messaging on the emails…this is all to the bad. It’s never too late to give during the holiday season. You can still send your donations by mail or online and get a tax deduction for 2014! This seems to think that I will give my end of the year gift simply to get a tax deduction. Terrific. But why should I? The only other information on the email is the name of the organization and the undeniable fact that it is the end of the year. For all of these, I click “delete” and move on. Whatever happened to giving someone a reason—beyond the date—to make a charitable gift? More, what does my gift do? How does it make a difference, change the world, help someone in some way, shape or form? While it is true that in order to get a gift, you must ask a potential donor to make that gift. But that is only part of the story. There are many many many nonprofits out there—most of them worthy of support. People tend to chose one over another because of a connection they have with the organization. So for starters, don’t send a blanket appeal to everyone on your list. If I have been a donor, begin your appeal by reminding me of that connection and how that has impacted the work you do. If I haven’t, tell me how support from others has made a real difference. And then connect those dots by showing me what my support now will mean (and not just that it will give me a tax deduction. Frankly, if that were so important, you would have heard from me and my financial advisors a long time ago). Donors give for a variety of reasons—usually because the organization has a need that talks to the prospect’s heart, or the prospect has a need that the organization meets. Most compelling, of course, if when there is a convergence of need. 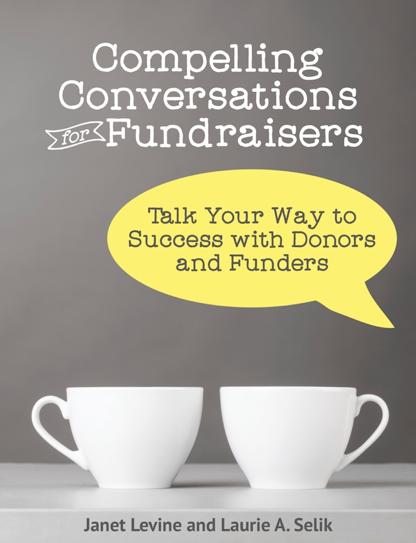 To know what speaks to your donors, you actually have to get out and talk with them. You have to ask, rather than always telling. You have to listen instead of always talking. That means, creating a relationship—be it virtually or in person—with your donors and prospects and ensure that they have a way (or many ways) to tell you what matters to them. When you know what they care about, you can craft your message to show that what you need, how to help your clients, what will make a difference is pretty much what they care about. And when they reach deep down to make a gift, remember that beyond thanking them, you must show why what they have done is really important and really, really does make a difference. Janet Levine works with nonprofits, helping them to increase fundraising capacity and build stronger, more effective boards. Learn more at www.janetlevineconsulting.com, or send Janet and email at janet@janetlevineconsulting.com and find out how she can help your organization thrive. This entry was posted in fundraising and tagged Ask, consistency, fundraising, messaging, needs, online giving, solicitations. Bookmark the permalink.